Food Cost Wiz: Reader Question: Margin vs. Percentage? Reader Question: Margin vs. Percentage? This month, Adam from New York wrote an email asking whether it is better to use contribution margin or food cost percentage. As many readers know, I prefer using contribution margin. My early experience in remote site support services showed me the value of tracking all costs by the number of patrons served. Percentage analysis is better than nothing at all. It is definitely a good start. You won't get answers to many questions with simple percentages but over time you will see trends develop. A little bit of extra work will provide operators with a better view of profitability. The contribution method will illuminate how an operation makes money. Caterers, on site feeders, clubs and other non-restaurant food service operations normally use the contribution method. Restaurants equipped with a top notch POS system can make the shift from percentage analysis to the contribution method. There are several key data points available on your standard POS reports. You need to track the number of guests served (covers), the sales per guest (check average), a category breakdown of menu item sales (PMIX report by category) and a ranking of your menu item sales (PMIX ranking report). 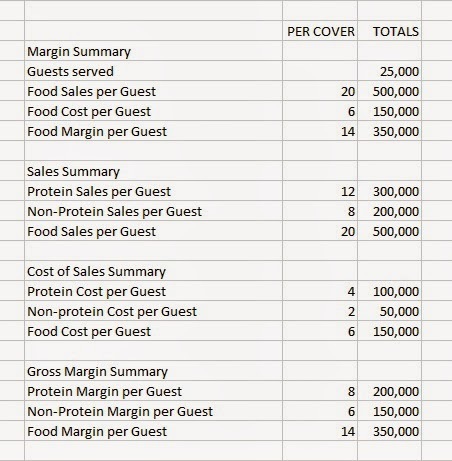 For any given period, your food cost divided by the number of guests served equals your cost of sales per cover. You can subtract this figure from your check average to yield the gross margin per guest served. I recommend a 3 month time frame for both the check average and the food cost per cover. In addition to your total food cost, take the time to break out the cost of all protein items including meat, poultry, seafood and cheese. You now have your food cost separated into the protein cost and the cost of all other food items (including non-alcoholic beverages). Armed with your number of covers, the average sales per cover and the cost of sales per cover, you can assemble a simple but powerful report. In our example, we served 25,000 guests in the most recent quarter. The food sales per guest averaged $20 producing $500,000 in food sales. Our food cost per cover of $6 produced a cost of sales of $150,000. We earned $14 per cover and a total of $350,000 in gross margin. Protein sales per guest averaged $12 and other food and non-alcoholic beverage sales per guest averaged $8. Our $150,000 food cost has a $100,000 protein component and a $50,000 non-protein component. Our gross profit per guest is made up of $8 from sale of protein items and $6 from sale of non-protein items. Smart operators have their server staff well trained in sales of non-protein items. These items may include extras like a side salad, a cup of coffee, garlic bread and a slice of pie. Most guests will order a single protein item (entrees, sandwiches, appetizers) and they will order 2 or 3 non-protein items (beverage, soup/salad, dessert). It is common to have a higher contribution from protein items. You may want to keep your direct labor and direct operating expenses equal to your protein item contribution. The profit from non-protein items will offset occupancy costs and help put money in the bank. Should We Include Labor In Our Standard Recipes?